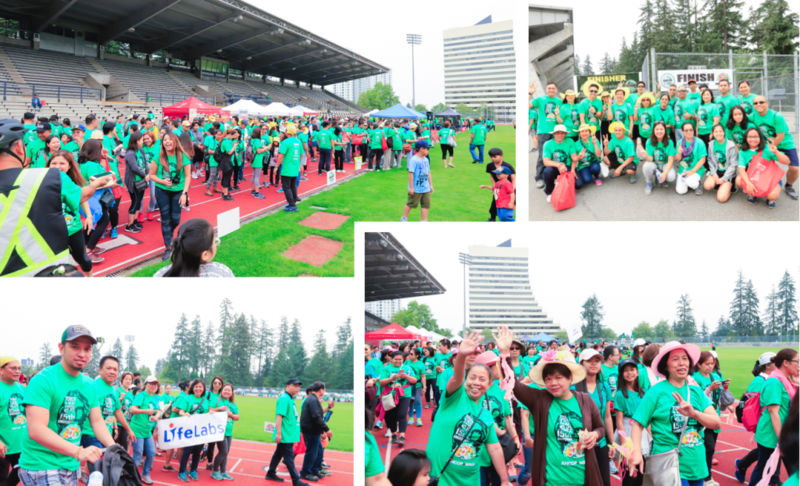 These walkers filled the Swangard Stadium in Burnaby, British Columbia to express their love for the poor. The tireless volunteers, leaders and coordinators made the event well organized, fun and safe. 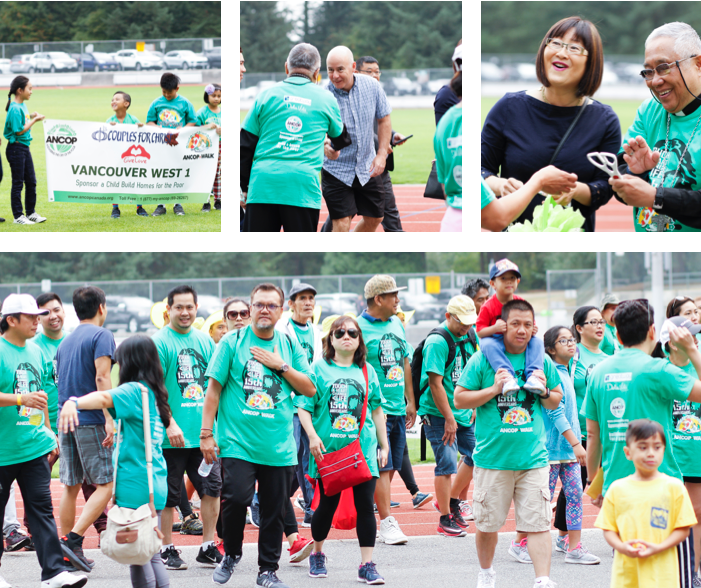 The cheerful crowd of givers was graced by the presence of Archbishop Ramon Arguelles, the Honorable Senator Yonah Martin who is dear friend of the late Senator Tobias Jun Enverga , and many other dedicated public servants coming from different cities like Hector Bremner and Jojo Quimpo in Vancouver, Mike Hurley in Burnaby and Narima Dela Cruz in Surrey. The kindhearted and well respected Senator Yonah Martin acknowledged the leadership and vision of ANCOP Canada and Couples for Christ (CFC) for the incredible faith in action. The newly installed CFC Sector Head Ricky Briones led the opening prayer and our Area Governance Team for ANCOP Senen Basbas gave the opening remarks followed by the inspirational message of Senator Yonah Martin. The couple Tony and Cookie Aytona also delivered a testimonial immersion experience from their most recent visit at ANCOP Vancouver Village in Sorsogon Philippines. Everyone brought home the joy in their heart to help the ANCOP Walk 2018 a remarkable one. Top prizes for the walk for 5K and 3K route were awarded for kids and adult categories. The youngest participant was still in the womb as expectant mother joined in the walk. The oldest walker was 82 years old and there were 8 ages 70 years old up participants whom given prizes also for the older walker category. 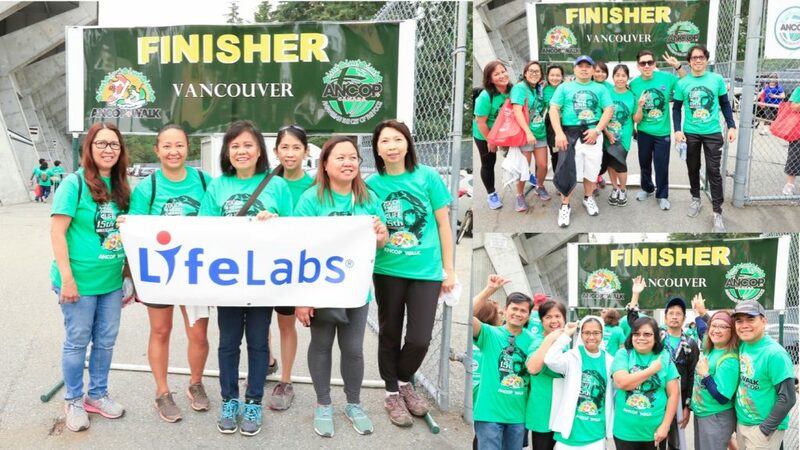 The crowd cheered up for the biggest family delegates Balitaan, Villarin and Sumbi families, the biggest family ministry Handmaids of the Lord, the Biggest Chapter Percentage Turnout won by Abbotsford and the Biggest Chapter by Headcount awarded to South 1 Richmond – St Paul. Major local sponsors like Primerica were present and Sukhi Bath Motors drawn Las Vegas Trip for two won by a CFC member. LBC Express also raffled balikbayan boxes. 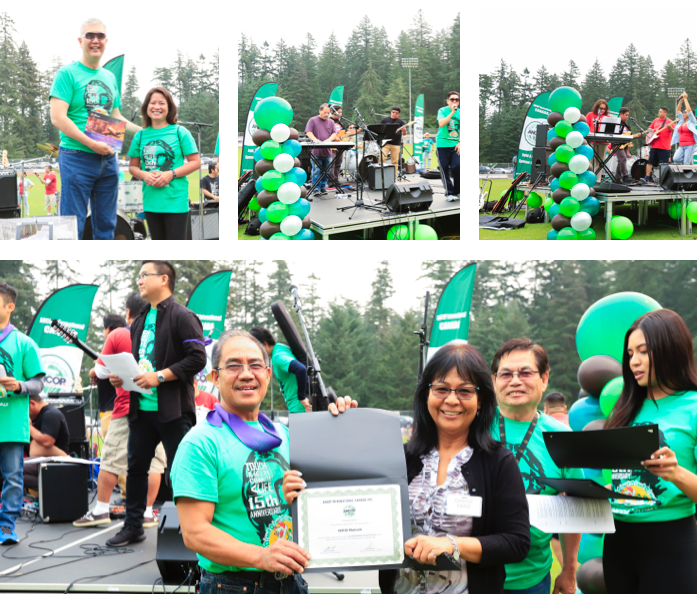 We gave out lots of prizes provided by Maxs, GMA Pinoy TV, Tim Hortons and Nandos while the people were delighted by the food and beverages prepared by our members and supporters to raise funds. The Holy Cross Regional High School also had ceremonial cheque turnover for one house during the event. 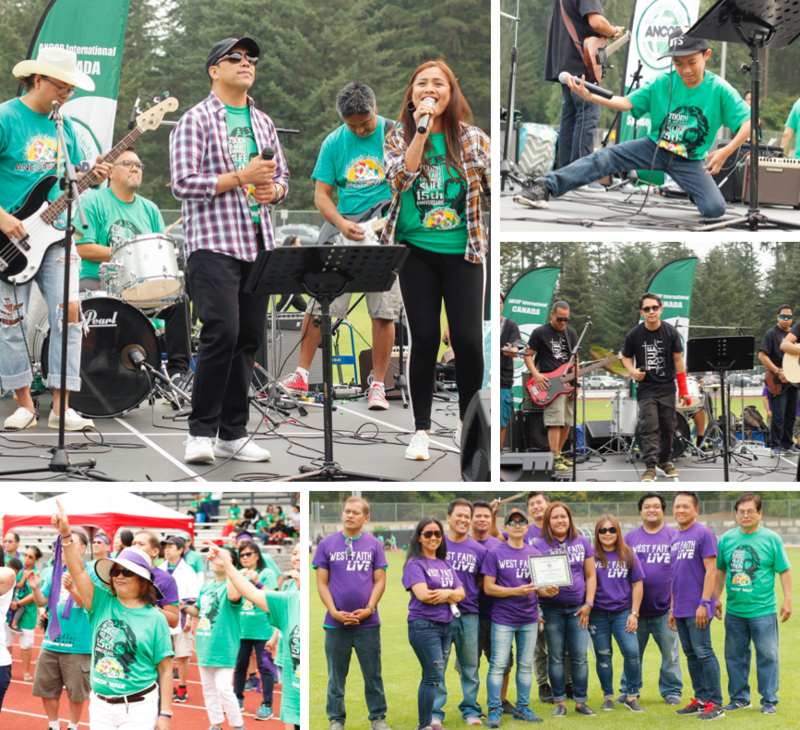 GVA’s ANCOP 15th Anniversary was very lively and in upbeat mood with the Band of Aklanon Sto Nino Association of BC as well as the live band music of Jojo Quimpo and the cluster bands formed just to entertain the flock of ANCOP advocates. The best talents showcased by the CFC band performances of North Cluster: North Clutter Machine Groove, East Cluster: The True Light, West Cluster: West Faith Live, South Cluster: The A.G.B.A.Ys, YFCs: The Sheepies, HOLD: Barangay 34 and KFC: Acid Harmony. The GVA ANCOP Team with Chito and Marie Concepcion, Senen and Virgie Basbas and this year’s ANCOP Walk Chairman Chris and Julie Canilanza are extending their gratitude to all chapter and cluster coordinators, CFC Area Governance Team and chapter/ cluster heads of GVA for the passionate support to make our this 2018 ANCOP Walk the biggest and the most victorious one since we first started this walk in Vancouver in 2003.